This beach ranks #4 of the "Best beaches in the Indian Ocean"
Direction Island has no hotels. The nearest hotels are located in the West Island. There are also about 500 residents on the neighboring Home Island, but for ordinary tourists it's hard to rent a room there. Fly to Cocos (Keeling) Island Airport (CCK). Next take a ferry. There is also ferry connection between Home Island and Direction Island. Interisland connection between the three main islands of the atoll (West, Home & Direction) is operated by Cahaya Baru. However, the Direction Island gets ferry only few days a week. 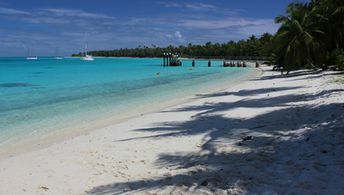 The best time for a beach holiday in the Keeling islands (Cocos Islands) is a dry season from August to December.